From planning and writing annual reports to planning a multi-channel communications effort around an organizational event, my experience has run the gamut. Following is a small sample of the communications and writing work I've done. If you'd like to see more, please contact me. 2013 organizational annual report. 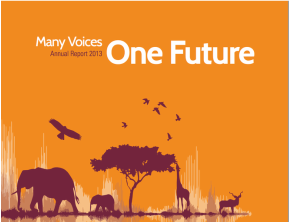 As head of all of African Wildlife Foundation's publications, I oversee the production of the annual report every year. This includes working with senior management to figure out topics to cover, brainstorming story ideas, assigning stories, writing and editing stories, art directing, presenting concepts to the CEO, and proofing and finalizing layout. I also work with relevant colleagues to plan the production schedule and get the report translated into French each year. The year before I came on board, the annual report was reportedly 3 to 4 months behind schedule, coming out in June. Under my direction, the annual report is typically printed and delivered in house by February or March. Article on endocrinologist shortage. Though I do not have a medical background, I learn quickly. During my freelancing days, I was hired to write a short article on the country's endocrinologist shortage, based entirely on an academic paper that appeared in a medical journal. Business column offering tips on energy saving. As managing editor of American Printer magazine, I wrote articles and news items on topics of interest to printing company executives. I also occasionally wrote a column, such as this column that offers tips to printers, who operate energy-heavy equipment, on saving energy (and money). Blog post on management training program. 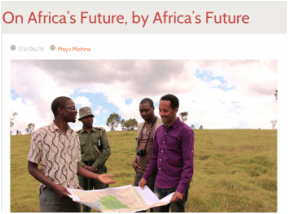 African Wildlife Foundation in 2012 began a management training program for young African conservation professionals. Each year, we provided coverage in our publications on the newest class of trainees entering the program. In 2014, to provide a new twist to our coverage, I organized and led a roundtable of existing trainees, including those who were just starting the program and those who were finishing up their first year of training. 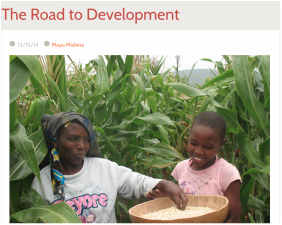 The inspiring discussion was covered both in a blog post and in our annual report. Blog post based on field visit. Visiting a remote part of Tanzania where our organization conducts field work, I was struck by the rough ride experienced on the dirt roads--but also the immense negative impacts of road construction on the environment. I wanted to put this inner conflict, between the knowledge that more infrastructure can often be destructive to conservation and the knowledge that more infrastructure can mean more comfortable lives for people. The result was this blog post. Organizational brochure. Prior to my employ, the organization had lacked a brochure for years, because there was disagreement at multiple levels as to the brochure's audience. I worked with my manager to determine the appropriate audience, collaborated with our graphic designer to figure out the general design, wrote the copy and art directed the brochure. Wildlife crime infographic. For World Wildlife Day 2015, our team wanted to publicize the UN's theme for the day, "Wildlife crime is serious... get serious about wildlife crime." In addition to a full complement of coverage, including a press release and media outreach, OpEds on the economic impact of wildlife crime and social media efforts, we decided to create an infographic to distribute to media and to use on our own channels. I wrote the copy and art directed the layout over just 3 or 4 days. Census process. To accompany an article on mountain gorilla conservation and census results, I worked with our graphic designer to come up with a graphic that illustrated the time-intensive nature of the census process. Give A Damn fact sheets. To accompany the website launch of WeGiveaDamn.org, the True Colors Fund wanted to provide downloadable PDF fact sheets that discussed some of the primary issues encountering lesbian, gay, bisexual and transgender (or LGBT) people. I wrote and proofed copy for more than a dozen such fact sheets, working closely with the graphic designer to ensure the fact sheets were accurate and aligned with the messaging on the website. Topic fact sheets for AWF. African Wildlife Foundation had not had updated fact sheets for several years. After coming on board, I planned out how many fact sheets we would need, ultimately writing copy for 10 topic areas where the organization has expertise (and also confirming accuracy of copy with relevant technical directors). I also worked with the graphic designer to plan a unified look to these fact sheets, providing art direction and ultimately proofing each fact sheet before distributing to organization staff for use. Zambezi Traveller 2-page spread. The Zambezi Traveller is a regional newspaper widely known and read in Southern Africa. Ahead of a UN World Tourism Organization conference in Zimbabwe, African Wildlife Foundation wanted an opportunity to publicize some of our key conservation achievements in the region. I worked with staff on the ground to identify appropriate projects, edited copy written by field staff and provided photos for use in this placement. 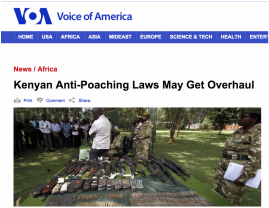 Voice of America story on anti-poaching laws. A reporter reached out, originally to be put on our mailing list, and I arranged for a meeting between her and some executives at African Wildlife Foundation to provide some information on the burgeoning issue of wildlife trafficking. That meeting eventually led to her writing an article on Kenya's new anti-poaching laws, for which I arranged a phone interview between her and our then-president. Membership newsletter redesign. The African Wildlife Foundation member newsletter had been operating on the same tired design for years. I first tightened editorial, bringing about more journalism-oriented content. Later, I oversaw the redesign of the newsletter. Currently, I plan stories for, write/edit/proof and art direct every issue of this quarterly newsletter. Partner newsletter. The partner newsletter, geared for the organization's partner organizations and funding agencies, had been on hiatus for more than 2 years prior to my employ. Its design was also tired. I relaunched the newsletter and together with our graphic designer redesigned it so it mirrored some of the brand elements of the organization's website and our other products. Currently, I plan stories for, write or edit, and art direct every issue of this newsletter, which comes out 3x/year. I also arrange for its printing and translation on behalf of our Africa staff. Press release on economic stimulus package for trade show. As a freelancer, I often did regular work for NPES, a trade association for equipment manufacturers and suppliers in the graphic arts industry, and its sister company, the Graphic Arts Show Company (GASC). GASC was coming upon one of its big annual trade shows, and was announcing a new "stimulus" package to encourage equipment sales. My assignment: to write a press release based on some basic information supplied by the client. Press release on Chelsea Clinton visit to project site. 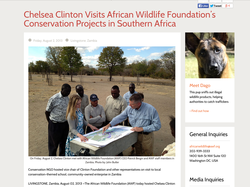 When Clinton Foundation Vice Chair Chelsea Clinton made plans to visit an African Wildlife Foundation project site, I wrote a press release on the planned visit and its importance. The visit, and need to write the press release, happened in a very short span of time, amounting to no more than a few days' advance notice, but I successfully wrote the release and obtained approval from both our organization's management and Clinton Foundation before distributing. Executive synopses for PRIMIR. PRIMIR, the research arm for a graphic arts trade association, was commissioning reports on the latest issues affecting the graphic arts industry, but busy graphic arts executives weren't reading them. The organization knew it wanted to do a smaller "summary" reports, but wasn't decided upon what format those reports would take. I provided a proposal to do a four-page summary, with standardized sections (like a "by-the-numbers" section, for example), and was hired to create these synopses for many of the 100- to 200-page research reports commissioned by the organization. We Give A Damn website launch. The True Colors Fund, a nonprofit organization dedicated to LGBT issues, wanted to launch a public advocacy website that would cover a range of issues affecting lesbian, gay, bisexual and transgender people. I was hired as the website copywriter and wrote more than a dozen pages on a variety of issues affecting LGBT people.